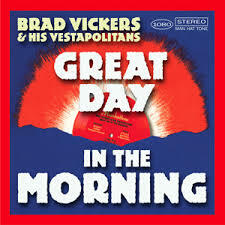 On Great Day In The Morning, Brad Vickers and his cohort of New Yorkers continue in the vein established over their first three releases: a full band, playing predominantly acoustially; a broad-minded attitude toward styles, with a pre-war blues and jazz feel often informing the music (due only in part to the presence of staple jug and string band instrumentation); and smart songwriting that eschews the usual suspects and subjects, and leans hard toward the lighthearted end of the spectrum. The title track, “Chapter And Verse,” “This Might Not Be Your Day,” and “Saving String Rag” are representative good-time numbers. More serious fare comes in “Sit Down And Talk,” a terrific slow number arranged for a simple trio that hints at both Delta blues and a posh, languid sound, and the gospel-inflected “Together For Good,” sung in subdued, soulful fashion by Peters and guests Christine Santelli and Gina Sicilia. The upbeat “The Way It’s Got To Be,” the Caribbean-flavored “It’s A Good Life,” and the roll-and-tumble “Train Goin’ Westward Bound” are other solid tracks. Covers from the songbooks of Tampa Red and Memphis Minnie round out the playlist. Vickers’s slide work is exciting, and the other instrumentalists contribute strong parts, especially Charles Burnham and Margey Peters on fiddle (if one likes that sort of thing), Matt Cowan (bari sax), Jim Davis (tenor and clarinet), V.D. King (banjolele), and guest Jeremy Baum (keys). The vocals are less assured. Vickers has a dispassionate style of delivery that, on the bright side, is unaffected. On the downside, it can tend to sound monotonal. His sometime singing partner Margey Peters has a kind of warble in her voice that recalls old-time records. That same quality, however, makes her sound pitchy. While there are other bands that take a determinedly throwback approach, none of them, to my knowledge, is incorporating that sound as casually as The Vestapolitans, who don’t exclusively trade on it. But I’m not certain who Vickers’s target audience may be. Fans of acoustic blues might find these proceedings a bit busy or overwhelming, yet even the uptempo numbers could, to the ears of dedicated listeners of electric blues, be perceived as a bit bloodless. In the happiest outcome, the Vestapolitans’ no-man’s-land stylings would be recognized by all as a welcome change of pace, marking the proverbial nice place to visit, even if one wouldn’t want to live there.